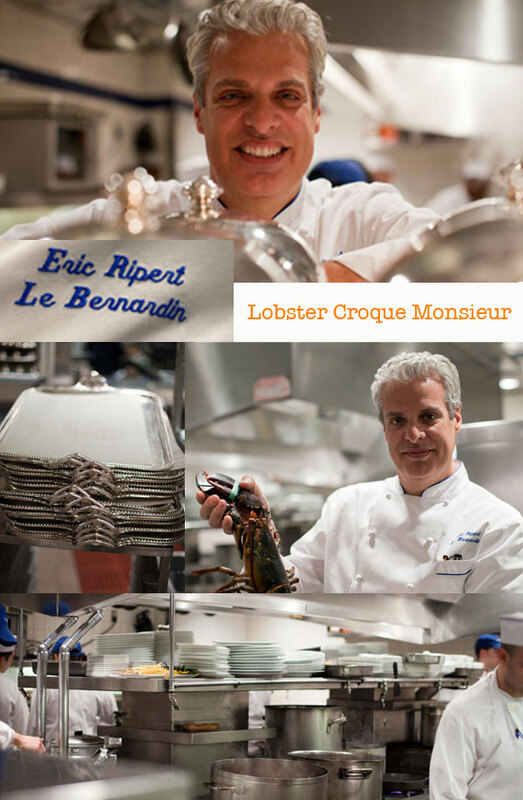 Today is National Lobster Day – so I thought I’d celebrate in style with a decadent lobster-filled version of the classic crock monsieur by the great French chef EricRipert. This recipe appears in MADE IN AMERICA and is a great example of how it makes cooking like one of America’s best chef’s accessible. To cook the lobster, bring a pot of salted water to a boil (water should be well-seasoned but not salty). Kill the lobster by inserting a knife in the head, just behind the eyes, and cutting down between the eyes. Add the lobster to the water and simmer for 7 minutes. Remove the lobster from the water and allow it to cool. Once cool, remove the claws and tail from the lobster, crack the shells and carefully remove the meat keeping it intact. Trim the end of the tail and pull out the vein. Slice the tail and claws into ¼ -inch thick slices, discarding the fatty claw meat inside the pincers. Cover and keep refrigerated until ready to assemble the croque monsieurs. Using a vegetable peeler, slice the Gruyere cheese very thinly. Before serving, spread the softened butter evenly on the outsides of the sandwiches. Preheat a nonstick sauté pan over medium-high heat. Add the sandwiches to the pan, Gruyere-side down and sauté for two minutes. Turn them over and sauté for one minute or until nicely browned, on the lobster side. To serve, slice the croque monsieurs on the diagonal, then on the diagonal again (you will have four triangles). Arrange the triangles on a plate. Serve immediately. Refrigerate for one month minimum, but preferably three months to a year. Remove a lemon whenever you need it, discard everything but the rind, rinse well, and finely mince for the sandwich. “Don’t let the lobster suffer, or as little as possible. “It’s important to put the cheese side down first so you leave it more time on this side so the cheese melts and you don’t cook the lobster too much. You don’t want to over cook it because it’s already cooked. Then the lobster would become chewy so it’s important to start on that side. “Let the bread become golden brown and crunchy and then repeat with the other side because you don’t want the bread to be soggy, you want the crunch on the outside with the moist middle. “Use a bread knife with a serrated edge to slice sandwich because if you don’t do this it slides. Lemon confit is an old recipe that originated in Morocco and a favorite condiment of Ripert’s. Lemons are cut in quarters but not all the way to the end and packed in kosher salt in a sterilized canning jar – (a one quart canning jar will hold 6 lemons.) Refrigerate and after a month but preferably longer, more like three months and up to one year, the confit is ready. Remove a lemon when you need it, discard everything but the rind, rinse and finely mince for the sandwich. “It’s a good sandwich,” says Eric Ripert in his understated manner. From what everyone has been telling me about Ripert it’s like calling him a good chef, HUGE understatement. Perhaps, at the risk of sounding cliché, it would be more accurate to say that he’s a good person. Those who know him can’t say enough nice things about him. My father-in-law, Jean-Jacques Rachou, who has known him since he arrived in America from the South of France back in 1989 is emphatic: “Good man, the best.” Within minutes of shaking his hand I understand what they mean. 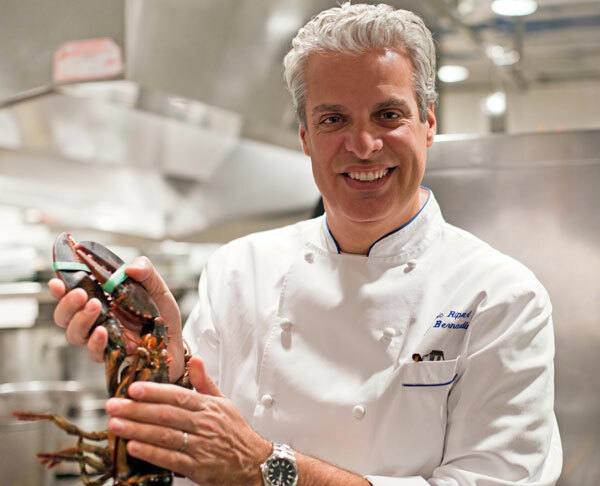 There’s something very special about Ripert – he’s very centered, calm and at ease with the world around him. Here is someone at the top of his field, the world of fine dining and I mean the very top of a very hard field to get to the top of, much less to stay there – with Michelin stars, James Beard Awards, bestselling books and TV shows and public appearances and a best friend in Anthony Bourdain no less – this is someone who in person is everything I’ve been told and so much more. This man is too good to be true! He never stops smiling, a big white toothy grin. He’s so humble about all he has achieved and so gracious when paid a compliment about his book, a specific recipe or his restaurant. His celebrity status has changed nothing. “When you are inside the restaurant, he says, “there is no such thing as a celebrity chef and I am mostly here, luckily TV doesn’t take that much time.” I suspect that it’s not the kitchen that is keeping him grounded, that’s just who he is. When I meet avec Eric Ripert at Le Bernardin we talk a lot about looking back through time for where his dish came from. He has a collection of old cookbooks at home which he likes to study – mostly French rather than American – to give him inspiration. We sit in the conference room in the offices of Le Bernardin – the walls are lined with hundreds of cook books. It’s almost impossible to find early croque monsieur recipes in early cookbooks. Perhaps the simplicity of the sandwich means it never made it in to the likes of Escoffier (we check in his copy, it’s not there). Or perhaps it’s too lowly? A regular croque monsieur is café food – that is, until it’s elevated to fine dining status by Ripert with the addition of caviar, smoked salmon and/or lobster. 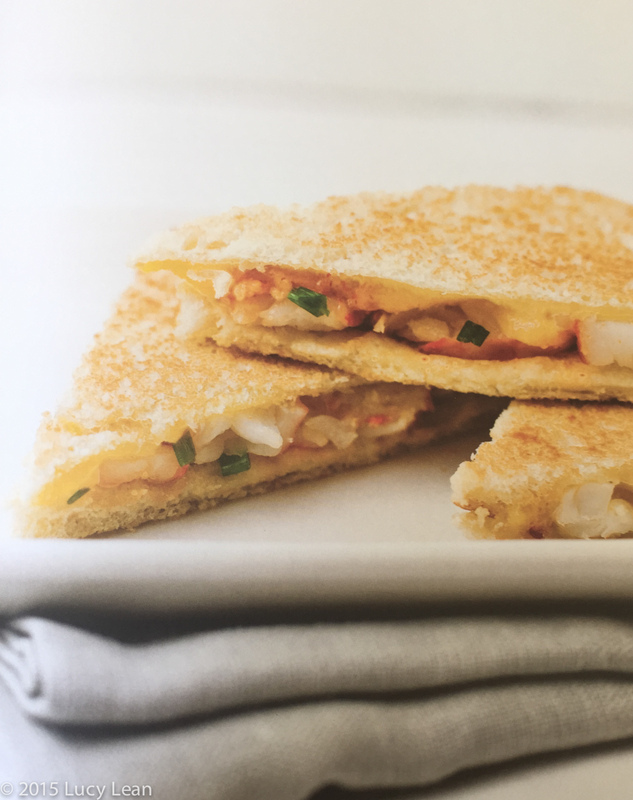 It also proves difficult to find references and recipes to its first cousin the American grilled cheese sandwich, with or without meat, in any of the early American cookbooks. Perhaps the closest are recipes for Welsh Rarebit – a mixture of cheese, butter– often with ale – that’s melted together in a pan, spread on toast and sometimes broiled. Over one hundred years ago Americans were already enjoying processed cheese. Mrs Corson writes: The ordinary American factory cheese is excellent for rarebits, because it grates easily, melts quickly and blends smoothly with the other ingredients. 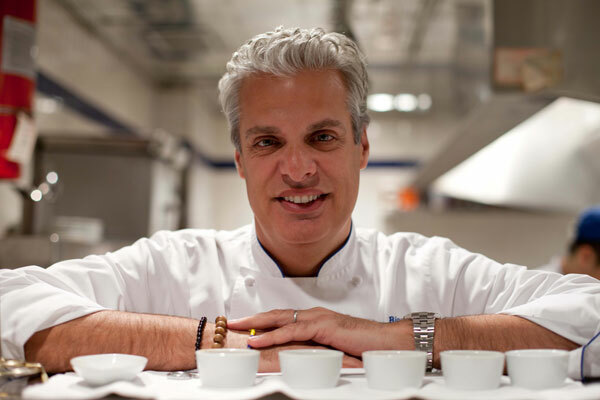 Ripert uses Gruyere in his sandwich rather than orange American cheese – he likes the way it melts and tastes. “The recipe itself is very easy,” says Eric. “Cooking the lobster is the most challenging part. You have to kill the lobster and make sure that it doesn’t suffer, at least as little as possible. I think for a lot of people it’s an animal that’s alive in front of you. It’s not like you buy a steak of lobster, so this can be emotional for a lot of people. 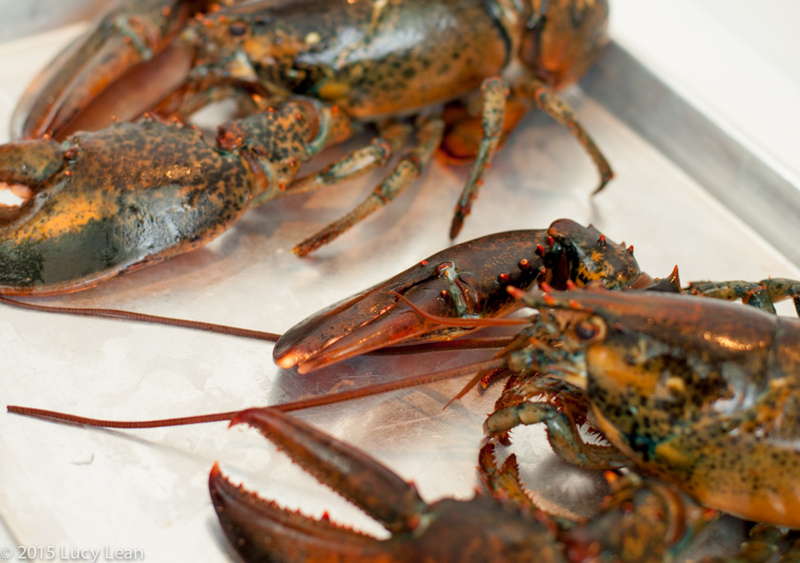 If you are an omnivore it’s a good experience because it gives you much more respect for the ingredient as you see the entire animal.” In the kitchen I ask if I can photograph him with a lobster – flown in from Maine that day. He gentle strokes the beast as he holds it up ready for its close up.